Vivo NEX 5G Prototype with Snapdragon 855 Showcased in China - Playfuldroid! Vivo is reportedly working on the 5G version of Vivo NEX smartphone. Today, China Unicom carrier from China shared an image of the Vivo NEX 5G smartphone prototype that was displayed at Qualcomm booth at the Xinhua News Agency media conference. The NEX 5G phone is powered by Snapdragon 855 chipset and it includes X50 LTE modem for 5G connectivity. The Vivo NEX 5G edition was showcased at the recently held China Mobile Global Partner Conference event in China. 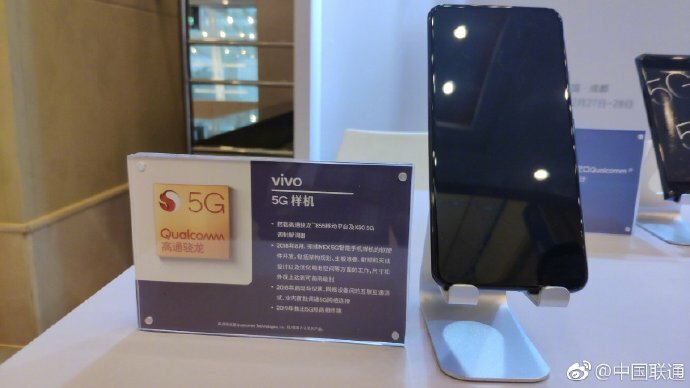 In August, Vivo had confirmed to the media that it has completed software and hardware development for commercial 5G smartphones. Vivo has planned to launch pre-commercial smartphone terminals in 2019. Along with other companies such as Huawei, OPPO and Xiaomi, Vivo is also expected to showcase its first 5G phone at the Mobile World Congress (MWC) 2019 tech trade show in February. The Vivo NEX 5G may feature the same specs as the Snapdragon 845 and 8 GB RAM powered Vivo NEX S smartphone. The Vivo NEX Dual Display features the Snapdragon 845 chipset and 10 GB of RAM. It is yet to be confirmed whether the Vivo NEX 5G will also come equipped with 10 GB of RAM.